Let us be in state of prayer. From Psalm 19, May the words of my mouth and the meditations of all of our hearts be acceptable in your sight O Lord You are our rock and our Redeemer! In this time of Lent, we are positioned to reflect and think about our lives, what we miss, and what we could improve. 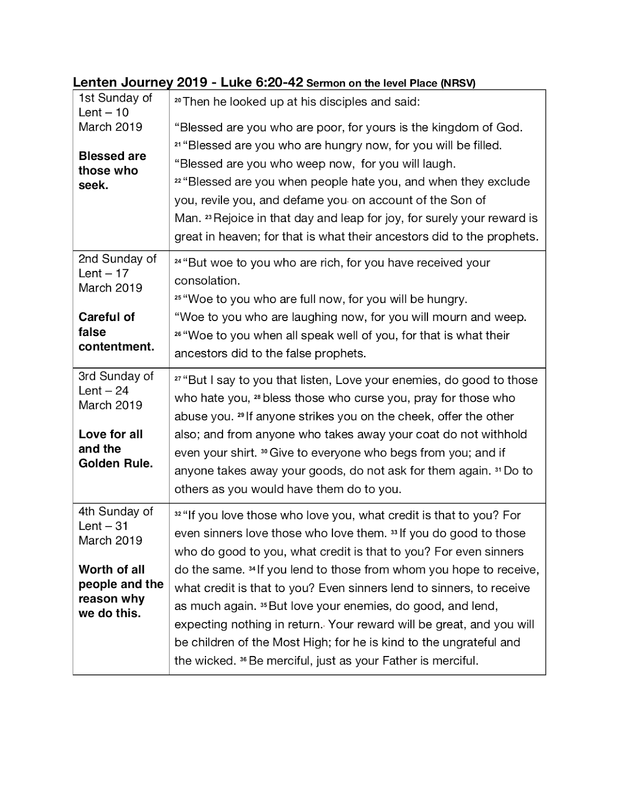 As we continue on this journey through Lent , you could still consider prohibitions -- like abstaining from chocolates, Facebook, adult beverages, swearing (I have heard some of you and you know who you are) or something like that. Yes, I have my own practice. If you have one, great! if you don’t, I would like for you to consider adding something to your lives this season. I submit to you to review and consider with me the sermon on the plain to serve as guideposts for our journey this year. 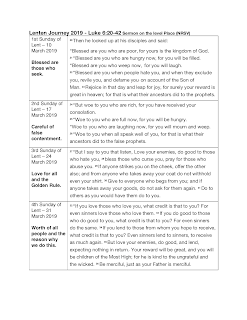 As I was working with the text, I saw the potential for gifts and focus points for each week -- even each day. I hope you will as well. Let the spirit move us as it did Jesus. What does Jesus do? Calls out the boloney. Then tells them and all present, I am on my mission (ministry) and no one will prevent me from doing God’s work. Further, you may not recognize Jesus’s work as it happens, but soon enough you will. In this passage, we see one of Luke’s chief concerns is that of hypocrisy. Here, Jesus laments over people’s attitudes towards the hypocrisy of the political elites, the religious elites here and the people who contently follow them. What is Jesus saying to us? That might be best explained when we look back a few chapters -- using our section of the sermon on plain. Last week, our group walked together through first part of this Lenten journey through the sermon on the plain. Allow me to recap. 1)Blessed are you who seek the Truth! 2) Trust in God 3) because you are not alone. Further that reward is the kingdom of God. I submit to you that God does not want us to wait until death to participate. Jesus’s sermon on the level place then brings us to some woes. for you will … weep. What are these woes? Woes against pleasure, no! These are woes against contentment. Yes, we are blessed when we seek and trust in God, but we must be careful not to fall into the trap of contentment because contentment is a fleeting illusion. In fact, contentment can lead to a form of idolatry rather than as venerating certain icons, money or personal success, but we are want to let these and worldly treasures prevent us from continuing to do what we are called to do. We have this throughout our lives, and I have a few examples where I have fallen short on this notion. Let me illustrate one. I was reminded of this when watching the film Christopher Robin (a story about the Pooh, Tigger and Eeyore characters and the Hundred Acres Woods.) When I, as a father, am called to be a father for Tyler or to be a spouse to my love, yet when work calls, I too often felt compelled to switch gears and that became my focus for a day, evening or weekend. How many times have I missed something because I just did not do what I was called to do over an presumption of importance: an illusion of importance. Even recently, I found myself in the middle of a project go-live and working an over-abundance of overtime to see successful objectives. Yet, at what cost? To consider this even more the irony is that it might have been easier to spend time with my family “doing nothing” than spend time anchored to my desk. Perhaps it is necessary. Perhaps that is the purpose of holidays – even Jesus reminds us to take time for ourselves. To counter these outside forces, I have intentionally enforced boundaries on these so that I might fulfill my promise and my call. It could have been easy for Jesus to hear the warning from the Pharisees here and stop what the mission and ministry, but that is not what God called of Jesus to do. Similarly, it could be easy for me or you to ignore truths in our society, especially when someone raises a potential warning and abandoned what we are called to do as followers of Christ. That might be safe, that might be the compelling thing to do, but is it safe and is it worth our attention? Why be content with saying the good words and then doing nothing with it? Why be content with just sitting in church when God calls us to do so much more. We cannot be content with things because then we become the Jerusalem that Jesus laments -- while the fox takes from us, hides from and abuses power. When you feel content with your Christian call today, you risk leaving the best part of yourself sitting in that pew when you leave worship and you risk not participating in God’s kingdom. So What are we called to do that we are content ignoring? What are we substituting for what we are called to do; what God calls us to do? Let us listen for a moment to some suggestions. Over the past few years, I have grown quite a bit more faith in our youth. In fact, I would say that they have re-invigorated some of my work in the public sphere, and the youth are genuinely exciting me to do work! Is it really ok to feel numb to another school shooting? Is it really ok to ruin God’s creation: our Earth: their future home? Is it really ok to deny someone their justice, fairness or equality, whether immigrant, queer, black or blue? Is it really ok to ignore the PTSD of honorable men and women returning from wars? Is it really ok to be that normal? The youth are compelling us to look at where we are -- just as Jesus does in these two pieces. They are calling out the fox and calling out Jerusalem - less we be that fox. My mother taught me a lesson once that when you move out of an apartment or house to leave it in better condition than we received it. Can we say that about our world and our youth – when we are content with “it is what it is”? We, who do nothing, to prepare our world for them better than we received it do nothing to help our youth. Perhaps then we do what the youth are calling us to do ! Perhaps then we do the work that is our mission as Christians – no matter who you are or where you are on life’s journey. We do not have to agree on everything but we don’t have to argue over the scraps dropped from the table of power. We do not have to make excuses for them. Like Christopher Robin, we can remember who we are and why we are here. But what God calls us to do for ourselves, our family, and our world. No we don’t have to fight over scraps, rhetoric and illusions. Let us listen to our youth. That has long been forgotten. We can be what God has invited us to be and to do his good work. God is calling you to continue the good work. When I read versions of the Nicene creed, I am drawn to memory of the way I recited the creed as a profession of faith in the Catholic Mass. I am drawn also to the rosary and how we would use that as a variation of meditative prayer. We say these things over and over in order to foster a sense of reverence, and I can still verbatim recite each prayer and the profession that we learned then. That is a unique way to do meditation by reciting common phrases and prayers -- and a great way to learn them. Since I do not fully subscribe to the Nicene or Apostles Creed these days, I look for other ways that might describe how I believe without being constrained to them. Today, I turn to the Tao Te Ching and ask which is so important that I would want to incorporate that into my meditation rather than as an empty mind or mindfulness meditation. Since the Nicene creed calls God into being through Jesus Christ and the holy Spirit, I am drawn to particular verses that talks about being born and into being. Let us meditate upon being. “Returning to the root is the movement of the Tao. Quietness is how it functions. Ten thousand things are born of being. The oneness gives birth to yin and yang. Yin and yang give birth to heaven, earth, and beings. Heaven, earth, and beings give birth to everything in existence. Meditating on this, I feel the different dimensions of God. Perhaps, others also might feel and see the different dimensions of God working with us and around us as trinity, God and spirit or as spirit or as Jesus. The power of God perhaps can be described, but like the words of the Tao, words cannot contain God. From God, the onenness, "maker ...of all that is seen and unseen", we have the spirit, Jesus and beautiful beings in Heaven and Earth. What this tells me in this meditative reflection is that whether Jesus was God incarnate, "God from God, true light from true light, begotten not made," a divine being created by God as an intercession to us, or a person with strong connection to God "by the power of the Holy Spirit", Jesus's work here on Earth, "for our sake... was crucified ...suffered, died..." is a powerful testament of Truth. How do we live out our testament of Truth? That we all are born of and made of the work of God that binds us to the being of God and how we work with each other is important. When I meditate on these, I can feel how God is of the yin and yang as we are in this world that has been gifted to us. In fact, Jesus teaches a version of the yin and yang and to find contentment rather than to persist in expectations through the sermon on the plain that we read during the weeks of lectionary in Luke. And of nature’s best beings. Let us be one with the Spirit, "the giver of life", that surrounds us and binds us. Let us be profound virtues of nature and expect nothing in return while nourishing life and shaping the world we live with our love . *As translated by Brown Walker, B. (1995). The Tao Te Ching of Lao Tzu. First St. Martin’s Griffin Ed: New York. Reading the material around Dionysius, it is fitting we might read this on the week of Transfiguration Sunday with such a mystical stories of Jesus and Moses. I again sense Taoism and parts of the Tao Te Ching, but this time, I would like to meditate on the principles of the duality very present in Dionysius work: the opposites as they all form as part of the one. Let our spirit rise and fall with this meditation. “Life Follows death and death is the forerunner of life. Thus, we witness transcendence from left to right and light to dark. From death to life and life to death. Out of darkness came light and from light we go to darkness. All are one with the presence of the Holy One, the Divine Wisdom. And suddenly transfiguration is a transcendence that we can witness in our own lives. With the “One who is beyond all”, we cannot literally comprehend that infinite image who embodies both the divine light and the Darkness to reveal the naked Truth: that we cannot speak it because we cannot describe it, but we can know it. How do we allow the light and darkness to transcend within us and in our being? How do we reject the perfect light and darkness by our feeble attempt to define its trueness, its being? Spirit of the living God fall upon us and be with us in all of your splendor and murky ways. Spirit of the One who gives us life and death, be nearer to our understanding and our denials. Reveal to us so we might be able to truly embrace what we cannot describe and allow that to be the naked Truth in our lives. Spirit of the light and the Dark, be far from us so that we might be comforted in your presence. And through your holy Spirit, open our questions and hearts to your True presence.